There is one thing most economists agree on: We shouldn’t read too much into the numbers for either September or October. Given the effects of the hurricanes, it is probably better to focus on the long-term trend, which suggests continued job growth. Average hourly earnings rose 12 cents an hour in September. That jump, one of the biggest one-month gains on record, may have been at least partly the result of the hurricanes — the storms pushed many low-wage restaurant and hospitality workers out of the work force, at least temporarily, which pushed up the average wage. Most economists expect Friday’s report to show more modest growth in October. Over the longer run, wages have been rising faster than inflation, but slowly by historical standards. That wasn’t a surprise early in the recovery, when there were millions of unemployed workers clamoring for jobs. But now that the unemployment rate has fallen, standard economic models suggest the United States should start to see faster wage growth. “We’ve been lamenting for a year about how we’ve had this great, really low unemployment rate, and yet the wage growth is not coming up to what we’d expect historically at these levels,” said Catherine Barrera, chief economist at ZipRecruiter, an online job site. There are reasons for optimism. The Employment Cost Index, a more sophisticated measure of compensation that considers benefits as well as cash pay, was up 2.5 percent in the third quarter from a year earlier, its fastest pace in two and a half years. Last month’s report may have been disappointing when it came to job growth, but another key measure of labor market health was much more encouraging: The unemployment rate fell to 4.2 percent in September, the lowest it has been since 2001. 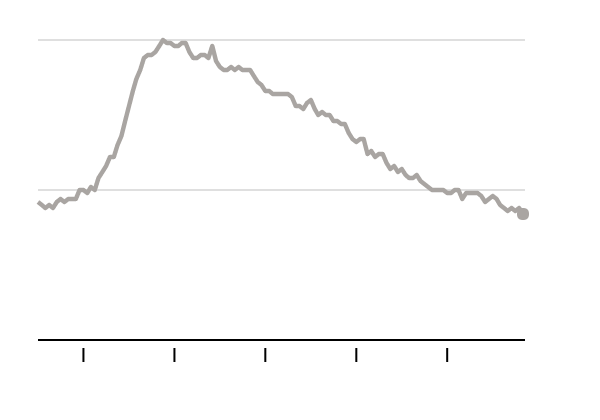 But the unemployment rate can be a misleading indicator. The government only considers people “unemployed” if they are actively looking for work. During the recession, millions of people abandoned their job searches as hopeless, and recent research suggests many of them still haven’t returned to work. There are signs, however, that the strong economy could be drawing more people back into the job market. The labor force participation rate — the share of adults who are either working or looking for work — has been edging up recently, despite the stream of boomers leaving the work force for retirement. The leisure and hospitality sector bore the brunt of the hurricanes’ impact, shedding 111,000 jobs in September. Most economists expect a strong rebound in October. The aftermath of the storms could also give a big lift to the construction industry, which is being called on to help rebuild after the storms. Don’t assume there will be a big bump in construction jobs, though. Construction companies have complained for years that they can’t find enough qualified workers, which could put a damper on hiring. Instead, the storms’ impact may be felt mostly in wages, as construction companies are forced to pay more to recruit workers. Friday’s report will also provide the latest update on the state of the retail sector, which has cut jobs for eight straight months. Those job cuts have happened even as retail sales have been strong — a hint that the problem in retail isn’t the state of the economy but rather increased competition from online sellers such as Amazon. Almost no matter the specifics of Friday’s report, the big picture remains that the job market is fundamentally healthy, and there is no sign that the broader economic recovery is losing steam. If anything, it seems to be gaining strength. Last week, the government reported that gross domestic product rose at a 3 percent annual rate in the third quarter, the second straight quarter of solid growth. Consumer spending, the dominant driver of economic growth in recent years, has stayed strong, with retail sales posting a big gain in September and consumer confidence hitting a nearly 17-year high earlier this week. But consumers are no longer alone in driving the economy forward. Stronger global growth has led to higher demand for American goods and services in recent months, aiding the manufacturing sector and boosting exports. “It’s finally feeling like the economy is starting to fire on multiple cylinders rather than relying solely on consumers,” said Brett Ryan, an economist at Deutsche Bank in New York. The strong economic data is part of what will most likely give the Federal Reserve the confidence to raise interest rates at its December meeting. Even a weak jobs report, Mr. Ryan said, is unlikely to lead the Fed to hold off on a rate increase.